In this Wednesday, June 14, 2017, file photo, smoke rises from Grenfell Tower in London. An inquiry into last year's devastating fire at Grenfell Tower in west London is underway. In the shadow of London's Grenfell Tower, the pain is as fresh as the newly laid flowers for the dead. One year ago, the residential high-rise was destroyed by a fire that killed 72 people. It was the greatest loss of life in a fire on British soil since World War II, a horror that left the neighborhood and the country in shock. On Thursday, survivors, bereaved families and people around Britain are marking the anniversary of a local tragedy that's also a national shame — one for which blame still is being assigned and traded. Was Grenfell a tragic accident, the product of government cost-cutting and lax safety standards, or authorities' disregard for people who lived in public housing? "I don't see this as a tragedy. I see it as an atrocity," Hissam Choucair, who lost six members of his family in the fire, told a public inquiry last month. 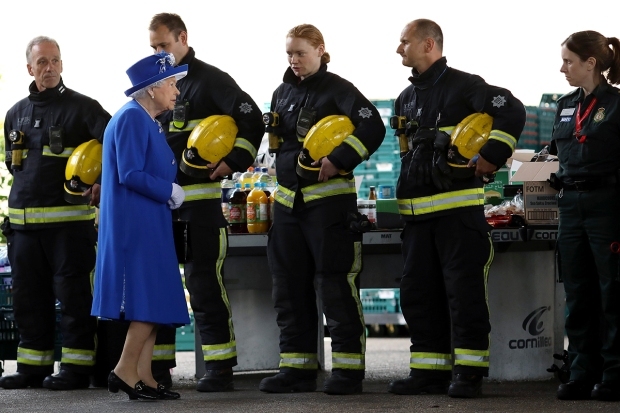 Britain's Queen Elizabeth and Prince William visited a West London site on June 16 where community groups have gathered supplies for those affected by the apartment tower fire disaster. The royals met with volunteers and local officials as well as firefighters and police officers. The queen has expressed her sympathies to families of victims of the blaze that ripped through the 24-story building, killing at least 30. For the somber anniversary rituals, survivors will gather near the base of the tower's shell before a nationwide minute of silence at noon. There will be vigils and marches across Britain, while landmarks will be lit up in green, the color of remembrance adopted after the lethal fire. "We want the nation to keep Grenfell in their consciousness," said Yvette Williams of local campaign group Justice 4 Grenfell. "The anniversary is about love and support — the fight can start again on Friday and Saturday — and keeping that humanity going on that day." A year on, the west London neighborhood around Grenfell echoes with sounds of construction. The ruined tower, which stood for months like a black tombstone on the skyline, is covered in white sheeting. A green heart and the words "Grenfell forever in our hearts" are emblazoned at the top. Antonio Roncolato, who lived the 10th floor, said Thursday's anniversary was "a time to reflect and to raise further awareness and make sure that the world is still listening, because we don't want this to happen ever again." Notice boards and walls nearby carry hand-written tributes, expressions of sorrow and promises of resolve: "RIP to the fallen"; "I love my Uncle Ray"; "RIP Yas"; "We won't fail!" Flowers, candles, and well-worn teddy bears that were left in memory of the dead are tended by local volunteers. A note from Prime Minister Theresa May, attached to a wreath of white roses, promises: "They will never be forgotten." Fire swept through a high-rise apartment building in west London early Wednesday, June 14, 2017, killing an unknown number of people and sending dozens to hospitals. More than 200 firefighters battled the flames, which engulfed the 24-story building. The fire broke out shortly before 1 a.m. on June 14, 2017 in the kitchen of Behailu Kebede's fourth-floor apartment. Kebede woke the neighbors on his floor and called firefighters, who soon arrived. High-rise apartment towers are supposed to be designed to stop apartment fires spreading. But within minutes, the flames had escaped Kebede's apartment and raced up the outside of the 25-story tower like a lit fuse. Many residents fled, but some on the upper floors observed official fire-safety advice and stayed put. The fire brigade changed the guidance at 2:47 a.m. By that time, the building's only stairwell was smoke-filled and treacherous. Several people died trying to get out. Others perished in their homes as they waited to be rescued, or died in neighbors' apartments where they'd taken shelter. Three people were found dead outside, having fallen or jumped from the tower. Rania Ibrahim, who died with her two young daughters on the 23rd floor, broadcast her final hours of fear and prayers on Facebook. Mohamed Amied Neda, 57, who had fled the Taliban in Afghanistan to build a life in Britain, left a voice message for his family: "Goodbye, we are leaving this world now, goodbye. I hope I haven't disappointed you. Goodbye to all." By the time the sun rose, a building that could be seen for miles around was a blackened, smoking shell. Hundreds of people were homeless and dozens were dead, though the destruction from the heat had been so great it would be months before police were certain of how many: 70 died that night, plus a premature baby, Logan Gomes, who was stillborn later that day. Maria del Pilar Burton, a 74-year-old resident of the 19th floor, was hospitalized after the fire and died in January. Local government workers, police and volunteers rushed to help, setting up temporary shelters and bringing clothes, food, money and help for the hundreds of people displaced from the tower and nearby buildings. Grief was soon joined by anger — at local authorities in Kensington and Chelsea borough, which owned the building; at the tenant management organization than ran the tower; and at Britain's Conservative government, seen as distant and uncaring. Many residents said they had complained about safety and poor maintenance and were ignored because the tower was home to a largely immigrant and working-class population. A public-housing block in one of London's richest boroughs, a stones' throw from the pricey boutiques and elegant houses of Notting Hill, it came for many to symbolize a divided and broken Britain. The anger is still visible on the walls around Grenfell. Mixed in with tributes to the dead are the words "TMO = terrorists" — a reference to the tenant management organization — and expletives directed at the prime minister. May acknowledged this week that the government had been too slow to act. She vowed that survivors would get "the homes and support that they need and the truth and justice that they deserve." After the fire, the government immediately promised to re-house all those displaced within three weeks. But some residents spent months in hotels, and many are still in temporary accommodations. May said Wednesday that 183 of 203 affected families have accepted offers of new homes, though most have not yet moved in. A judge-led public inquiry finally got underway last month. 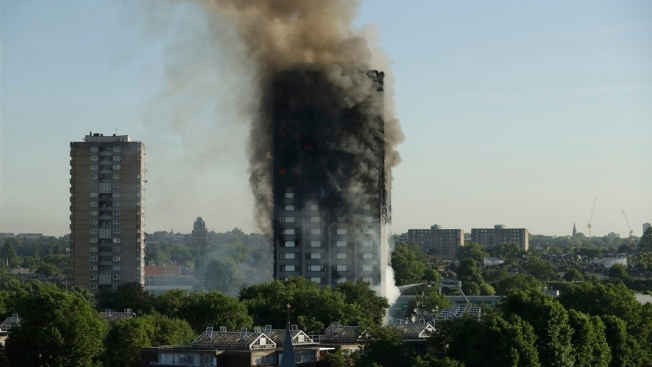 It will take 18 months and look at the fire's causes, the response to it and Britain's high-rise building regulations. But some survivors are critical because it won't investigate wider issues around social housing and social policy. Already, the testimony has been damning. A report by fire safety engineer Barbara Lane listed multiple safety failings, including the flammable aluminum-and polyethylene cladding installed on the tower's facade during a recent renovation. Stephanie Barwise, a lawyer for some of the survivors, said the cladding helped flames spread "more quickly than dropping a match into a barrel of petrol." The safety failures at Grenfell have national implications. More than 300 towers around Britain have similar combustible cladding. The government says it will spend 400 million pounds ($530 million) stripping the cladding from publicly owned high-rises. Questions have also been raised about whether lives were lost because of the fire department's "stay put" advice. Police are considering corporate manslaughter charges in the blaze, but no one has been charged. Tony Travers, a professor of government at the London School of Economics, said the disaster was likely the result of "a systems failure" rather than a single cause. "It's likely that there will not be a single guilty person or institution, but more a chain of events that together led to a catastrophic failure," Travers said. Even if the inquiry identifies causes and who deserves to be held accountable, the formal review is unlikely to end Britain's soul-searching over a disaster with victims from 23 countries — taxi drivers and architects, a poet, an acclaimed young artist, retirees and children with bright futures. "Ill fares the land that left these people to be so exposed to such trauma and such death," Danny Friedman, a lawyer for some of the bereaved families and survivors, told the inquiry. "In the end," he said, "the Grenfell Tower fire is an example writ large of how inequalities of political, legal and economic power can kill people."